Glue is an unsung yet essential part of jewellery-making but, just like any essential tool, there is a different glue for every job. Today, I thought I'd share a bit about what holds it all together, which glue is best for which job and offer some thoughts on my favourites. Strictly speaking, glue is an adhesive used for bonding, fastening and binding things together. Some are activated by pressure, some by heat, some by exposure to the air, some by contact and yet others by mixing two parts together. Hundreds of years ago, man made glue from all manner of things, from tree sap/resin and plant gums to insect insides and animal hides. By the early 20th Century, various man-made polymers led to the development of synthetic adhesives. I'll start with E6000. Really, it's my go-to adhesive. Like Frank's Red Hot sauce, I put that s#%*t on everything. It's billed as an industrial adhesive and it dries clear. It's easy to remove any glue that strays outside the join and it really bonds things well. In fact, it pretty much bonds anything to anything. 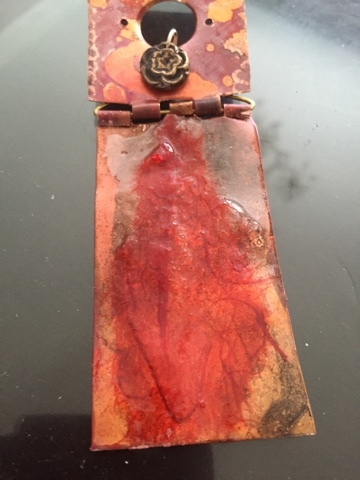 I use it to bond metal to leather, leather to leather, flat back crystals on any surface, beads onto anything and to attach my bead embroidery to backing fabric. I know some people are put off by the smell. It doesn't bother me and I find the smell dissipates after a day or two. I have tubes of E6000 in every size around the house and I never pack supplies for a class without including a tube. For accurate pinpoint distribution of the glue, you can put some into a syringe to squeeze out. Those who bedazzle using crystals and the Crystal Katana do this. 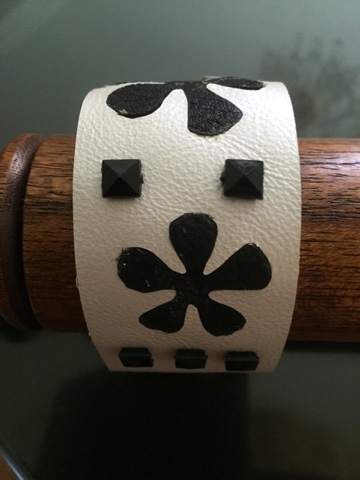 In this leather cuff, I glued in the black flowers and glued on the vintage nailheads with E6000. Often I find myself needing to tack something down for placement until I can affix it permanently by sewing or riveting. In that case, I'll use a glue stick or a dab of Aleene's Tacky Glue. It's inexpensive stuff, but any white glue will do. On this piece, to ensure the word create lined up with porthole, I used a dab of glue (or you can use a glue stick) so I could shift it around until I found the right placement. The glue held the paper while I positioned the mica, punched holes and riveted everything together. And speaking of Aleene's, they have a huge line of glues, each one created for a specific job. For instance, there's No Sew glue to temporarily glue fabric until you sew it together. There's Jewel-It for bedazzling and OK To Wash It. That's just a few. Buy a pack of sample sizes to try them out. I also turn to resins and other adhesives to attach paper to metal or fill empty bezels and spaces. Lisa Pavelka's Magic-Glos is a no-mix one part resin that requires UV light for curing. I used it here, to attach Japanese mulberry paper to copper. There are several two-part epoxy resins that can be used as glue and are technically an adhesive. These include Ice Resin. 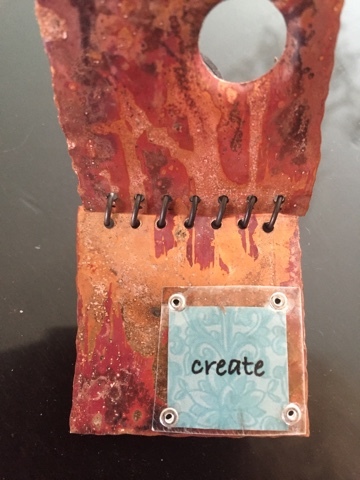 I use Mod Podge to glue paper to metal or leather and it also preserves and imparts a shiny coating to your work. You can also get Mod Podge with sparkles included or you can add glitter or flat backs or other things for fun. It has a fairly open working time. For instant bonding, crazy glue and its many clones are your best bet. Use them sparingly. GS Hypo Cement has a pinpoint opening that's great for quick application to a small, specific spot such as a knot (it's great to bond a knot in elastic thread) and has a cousin specifically made for fabric. Beadfx carries a myriad of glues to cover all your needs: E6000, leather glue, Devcon Epoxy, Swarovski's epoxy glue, Hypo Cement, Ice Resin and all the syringes and tips to make gluing easy. Explore them all and make sure to add them to your craft tool box.